The ‘unbearable lightness’ of intimidation and murder in Pakistan has manifested once again. 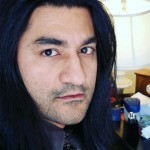 The eulogies are pouring in; speculations are rife about who is behind the assassination of yet another liberal social activist and on social media a familiar war of words has commenced. Despite the fact that one bright light after another is being summarily extinguished, it appears that self-righteousness is still the prime mover of the national discourse. For the legion of Google scholars and keyboard Jedis, it’s all or nothing; either faith in its entirety must be indicted or the blame must lie elsewhere. There can be no consensus and no compromise, we deal only in absolutes. This, unfortunately, is the charred and scarred landscape of what passes for intellectual debate these days. And most odiously, nowhere is this deluge of egocentric idiocy more apparent than on the social media pages of the deceased. So spare us the crocodile tears. Spare us the sermons of religiosity and secularism. We have lost another specimen of an endangered species to a predator that we are still unable to fully define. We continue to seek answers in ideas – as we should – but ignore the real, breathing, fleshly entities that recruit, indoctrinate, fund, militarise and detonate. We continue to remain deluded that debate and reasoning can stop such psychopathy. See, ideas can be very powerful, but they are not guns, they are not bullets and they are not the finger on the trigger. Yes, there is a point to all of this. His murder is the needless proof that the government of Pakistan has no intentions of protecting the lives of anyone other than the ‘VIP’ citizens. The state seems to exercise its dominion only at certain points by choice. Elsewhere, death and fear has taken over. The ‘writ of state’ is only established when the poor are beaten and evicted. Law enforcement is a joke. Justice is a distant dream. No change of any sort is possible under the climate of fear where dissenters are picked off one by one with consummate ease. There cannot be progressive legislation or an end to extremism when there is no freedom of speech without risking one’s life and limb. If this madness continues, there will be no one willing to speak out. The ones who dare to speak out are being suppressed for doing so. Examine the targets for a minute. They’re not the ones with funny names on social media or the ones blogging about their amatory excursions. Neither are they the ones selling second-hand anti-Muslim bigotry. They are targeting the ones who have taken a stand on specific issues. Rashid Rehman Khan. Sabeen Mahmud. Khurram Zaki. Think blasphemy laws, free speech, sectarianism, minority persecution, women rights. Think Lal Masjid. That is what tyrants and sociopaths fear – people who reveal matters that go to the very core of what constitutes a misogynistic, patriarchal and pretentiously theocratic dispensation. They know their enemy and it is time that we know ours. Progressives must realise that they need to unite and find strength in unity and numbers. Find consensus issues that can be worked on sincerely. Protect yourself and each other or else we will end up with one martyr after another, one moving tribute after another – and nothing to show for it. Internecine bickering over matters of such significance as a tampon display between activists that are otherwise brilliant, brave and tremendously potent will need to be put aside. Imagine the impact that could be made if many spoke as one. Lest we have any illusions about what we are up against, here are a few lines from William Blake’s The Marriage of Heaven and Hell. 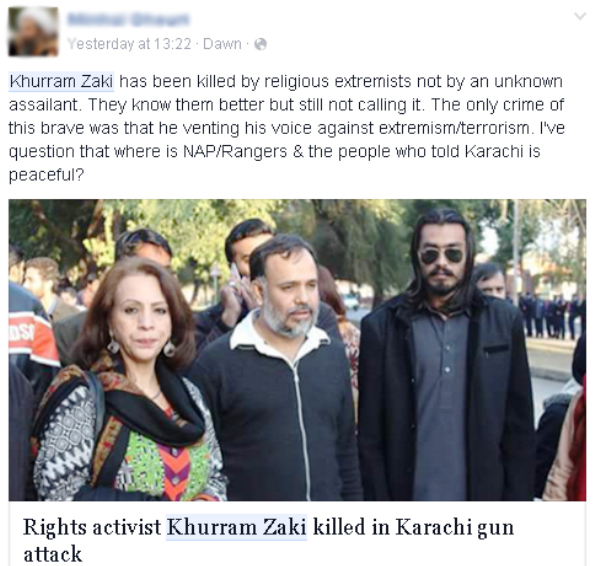 Rest in peace Khurram Zaki. Maybe one day this land will learn what you died trying to teach. Right, twist someone who was a critic of Sunni Islamist extremism and who carried out civil protests against openly roaming personalities and groups such as Lal Masjid’s Abdul Aziz and ASWJ as advocating Shia terrorism which barely exists. Assassinated by terrorist militants, continues to have his character assassinated by their apologists and sympathizers. On LUBP you’ll find gleeful posts celebrating the assassination of Sunnis, justifications for the Rawalpindi massacre and justification for Shia terrorism in general. You’ll also find blatant abuse of revered Islamic personalities & blatant racism against Pakhtuns and Arabs. 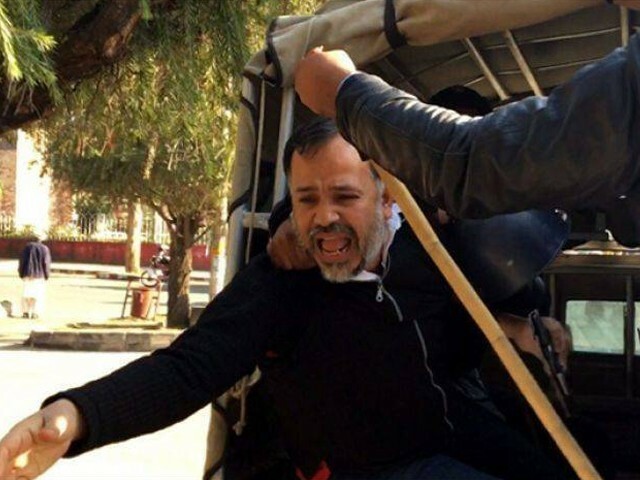 This is the type of “peace activism” & ” human rights advocacy Mr. Zaki did. How could you not find Khuram Zaki objectionable? Among his gems are claims that over eighty percent of Deobandis (of South Asia and Afghanistan) “support ISIS”.The evidence for this absurd claim is a poll on AlJazeera.net open to anyone, anywhere.